Developer Gary Grossman, who has donated big money to local politicians, is set to bring his San Luis Ranch project to the SLO Planning Commission. Grossman, a major donor to San Luis Obispo County Supervisor Adam Hill and Hill’s political allies, owns the former Dalidio ranch that was the center of a longtime development controversy in the city of SLO. The ranch is a 131-acre property between Highway 101 and Madonna Road, which is located in the county but may soon be annexed by the city. On Wednesday, the SLO Planning Commission will consider approving an application to the San Luis Obispo County Local Agency Formation Commission (LAFCO) for annexation of the San Luis Ranch property. The planing commission is also being asked to approve the environmental impact report and a general plan amendment for Grossman’s project. Plans for San Luis Ranch include up to 580 homes on 40 acres, as well as 60 acres of organic farming and open space. Grossman is also proposing 200,000 square feet of commercial space, 150,000 square feet of office space and a 200-room hotel. The homes Grossman plans to build range from 250-square-foot apartments to 2,200-square-foot houses. All of the homes would be constructed on small lots, which would be no larger than 3,200 square feet. In order to mitigate the impacts of the development, Grossman said he plans to contribute millions of dollars toward infrastructure in the area, which would include new streets and possibly a Prado Road overpass. Unlike Dalidio’s project, Grossman’s planned development has consistently overcome regulatory hurdles. Previously, the San Luis Obispo County Airport Land Use Commission set limits restricting the plans of developers, like Grossman, who seek to build high-density housing on the city’s southern edge. But, the last SLO City Council voted to override the commission and allow high-density housing near the airport. Grossman’s plans may return to the council on July 5 as the city formally considers submitting an annexation application. Great place for dense housing. Right on the takeoff and landing path to the airport. 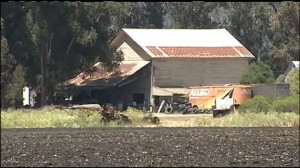 There’s already been one jet crash right on this site, but since it was a farm, only the people aboard were killed. When the inevitable happens, everyone will ask: “Why did they ever let them build that there?” Why indeed. People, please stick to the issues. personal attacks and other off topic comments removed. I wonder how much grease this Grossman fellow had to pump into select sups and county gov’t employees to get this passed? The sewer farm will be ripe with Cal Poly growth and SLO growth piling up to be shoveled into someone else’s back yard. For the traffic circulation, get ready for SLO Angeles. The perceived good news (for some) is that if YOU buy a few of these bungalows, they can be sold later to transplants familiar with congestion and YOU will be able to afford life somewhere else. I like single family homes as much as anyone. But there is also a need for affordable and efficient housing, especially so close to the center of town. They ought to build an actual apartment building. For affordable housing around here, most have built crappy little condos that cost only slightly less than a house and aren’t very functional, like 800 sq ft spread over three floors, half the place taken up by stairs with only outdoor parking. Real apartment flats, built over a parking garage would be better. “possibly a Prado Road overpass”, why possibly, why not definitely will include and not just an overpass but a complete interchange, on and of ramps in both directions. Because of the high cost of such a project. And whatever price tag is on it now will be twice as high when they go to actually put it in. He’s sounds smart to be non-committal, especially when it isn’t a requirement to get local approval. Do you forget that the Gov’t was going to under-write the overpass etc. when Ernie Dalidio was trying to develop the property? I think the were going to waive 20 years of sales tax receipts as well to make it happen. An overpass on Hwy 101 would also require Cal Trans–State involvement–not to mention the Feds in some way. Can you say–Cha Ching? Additionally, where are all of the arguments this time around that we have to consider the aesthetics for the “Gateway to SLO”. Tightly packed housing with light commercial is so much better than a 100% commercial project…..aesthetically speaking…or so I am told. IF you want SLO to grow, and by extension the county, then you should not develop underneath the flight path of the airport. A more fully functioning airport will be more beneficial in the long run than this particular development. Give those homeowners 20 years to settle in, and then we’ll hear about lawsuits for their noise pollution. I know of two plane crashes that have occurred on this patch of land, or close to it. So let’s pack a bunch of home in there–Cerritos style–what could go wrong? Use the land as currently zoned. I am willing to bet someone would step in to continue to farm it. There should be a navigational easement put in place for the approach and departure paths for the runways at SLO airport. Paso Robles did it years ago to preserve the flight paths at the airport and obviously for safety reasons. Every property around the Paso Robles airport has this disclosure included when there is a sales transaction. 2 things happen when this easement is in place. The first and most important is for safety, that should be a no brainer. And the second states it very clearly, we were here first so don’t complain about us in the future.. Cause Grossman doesn’t want to pay for it, and the city says “fine, we’ll stick taxpayers with the $60 million cost. More giveaways to developers. Why people think this is a good developer is beyond me. Call it what it is. Grossman paid bribes. It’s called corruption. it’s called “business as usual” when it comes to government and the public sector. Corruption; it’s the way things get done in SLO county. What has anyone ever done about it? Nothing. He paid $5000 to Dan Rivoire’s bike coalition group, then to “avoid conflict of interest” councilman Rivoire got himself a new job. So the “bribe” is now OK. Go figure. How do you put bedroom,kitchen, bathroom in 250 sq ft? Is this one of the new small houses and he will probably charge $1000 + a month for this. Rents and buying a house is out of hand in SLO . None of them are worth the costs. Another project that sounds good and looks good on paper. Eventually these proposed high density projects will prove to be a disaster. Density clearly causes problems, just ask any police chief were most of their disturbance calls come from. Mr. Grossman has a high density project under construction in Templeton at the former sales yard location. There are minimum backyards with 2 story homes which provides no privacy at all. It would be very interesting to have a psychological report included in the EIR reports for these excessively high density projects as I have sat in sessions where it has clearly been stated that density causes problems. Examples would be in the larger cities where high density projects deteriorate over time and become magnets for crime. Do we want to become just another large city with all of the problems that come with it. The government may want to for the fees but I wonder what the people want? Housing density must be increased to build more affordable housing. Fewer and fewer residents can afford to live in a typical “Brady Bunch” house. The population is increasing and people need somewhere to live. We need to use the new buzz word for politicians “unintended consequences.” They should all comment on what they perceive the unintended consequences might be. There are always 2 sides to every story, let’s put all of the cards on the table and then make the correct decision. Well, when our president is a real estate developer who used shady business practices to enrich himself at the expense of the community, should we expect any different outcome here in SLO?